I’ve often heard friends and acquaintances relate stories of prejudices they experience in relation to race and ethnicity. Many bemoan the fact that despite having lived in Australia for years, they are still viewed as foreigners. So the observation by the famous brain surgeon Dr Charlie Teo that Australia still demonstrates streaks of racism (see Herald Sun story below), probably strikes a chord with many. I think many of my contemporaries, from either Malaysia or Singapore, would quietly nod in agreement. Yet many of my contemporaries themselves unfortunately, demonstrate even more explicit racism than the forms I have encountered (yes I have encountered them) here in Australia. In Malaysia it was common practice for both the dominant races – Malays and Chinese – to look down on Indians and belittle them. Indians are viewed as confused, convoluted and untrustworthy in the sense that they say something and do something else. “Keling Account” means messy account keeping. “Black Skin” is often used to denigrate them as outsiders of a community. Many Chinese in Malaysia hardly step into an Indian eatery on their own. Even now, I often cringe when people I like make racist jokes against Indians. Malaysian Chinese are often the guilty ones in maltreating foreigners such as Indonesian maids. I know of church leaders whose wives mistreat them, and “respectable” community leaders think nothing of dishing out the worst working conditions. Working 18 hour days, sleeping in small dirty corners, eating meagre food out of dirty utensils, total lack of personal freedom – these were common working conditions. A recent news story on The Age tends to suggest this terrible treatment of maids is still going on in Malaysia – see second story below. I guess it isn’t a problem with Australia as much as it is a problem with humanity. Listen to the FULL nine minutes thirty interview with Dr Charlie Teo where he discusses some of his experiences being Australian. PlayDr Charlie Teo speaks out on racismListen to the key moments of the Dr Charlie Teo interview where he discusses some of his experiences being Australian. UPDATE 12.19pm: RACISM still plagues Australia and migrants are being victimised, one of Australia’s most respected neurosurgeons says. Dr Charles Teo, the son of Chinese immigrants, who prolonged the life of Jane McGrath and has saved the lives of hundreds of Australians, said it was wrong to deny there was racism. At a launch of Australia Day Council celebrations yesterday, Dr Teo said that racism was still “very much alive in Australia”. “I don’t quite like it when I hear politicians reassuring the Indians that there’s no racism in Australia. That’s bull—–,” he said. Former premier Jeff Kennett, former Australian Medical Association president Dr Mukesh Haikerwal, singer Kamahl and ex-police commissioner Christine Nixon have all said that racism exists. Do you agree with Dr Charles Teo that racism is still alive in Australia? But Premier Ted Baillieu said he did not think Australia was a racist country. “I don’t deny, and I don’t think anyone would deny, that there are in any community people with racist attitudes,” Mr Baillieu said. “My message to them is that Victoria has a very, very proud record of defending our multicultural base and promoting that multicultural community. Dr Teo said his daughter had been a victim of racism. “My daughter was just saying to me the other day, very sadly, she doesn’t like Australia Day because she has in the past dressed up, got into the spirit of things, put a sticker on her face, worn the green and gold and been told by drunk Australians to go home because she looks Chinese,” he said. He knew of an Indian neurosurgeon who had come to Australia to study for three months who was spat on in the street and told to “go home”. But Dr Teo, who holds the Order of Australia, said migrants also had a responsibility to integrate into Australian society. Mr Kennett said that racism occurred among children, but he taught his own grandchildren to be tolerant of other races. “I think there always will be elements of racism and it is often manifest itself in different ways,” he said. Melbourne was gripped by a wave of racist assaults on Indian students in 2009, which has been blamed for a drop in the number of students from that country enrolling here this year. Dr Haikerwal, victim of a vicious bashing in 2008, said Australia was overall a welcoming society, but racism did exist. He was in “the wrong place at the wrong time” when he was attacked, but Indian students were racist targets. “Attacks shouldn’t happen against guests of our nation,” he said. Former Victorian police commissioner Christine Nixon said all Australians had come from other countries. “There is racism particularly against our own Aboriginal people and it always surprises me since we’ve all come from other places,” she said. We have special discounts to get you 70% off Business Class Tickets. Cambodian maid Orn Eak, 28, with her son Ho Bora, 5. Orn Eak was abused for almost two years by her Malaysian employer. BEATEN, starved and treated as a slave in a Kuala Lumpur apartment, Cambodian maid Orn Eak says a one-metre snake ended her almost-two-year nightmare in Malaysia. ”When the snake crawled into my employer’s apartment she blamed me and kicked me out,” says Orn Eak, 28, one of thousands of Cambodian domestic workers who have been exploited and abused in Malaysia. ”I got the blame for everything, including the death of my employer’s elderly mother,” she says. Orn Eak’s body is covered in scars from beatings by a Kuala Lumpur woman who employed her through a Cambodia employment agency in early 2010. Single with a five-year-old son, Orn Eak says she joined 30,000 other young Cambodian women and girls working as maids in Malaysia because her mother was struggling to survive in their village in Kompong Thom province. In Kuala Lumpur, Orn Eak had no days off and worked from dawn into the early hours of the next morning caring for her employer’s disabled mother. She says she was frequently beaten and often hungry. The mistreatment worsened after the old woman died in hospital. ”I missed my son and mother very much, but I knew I had to keep working for them,” she says. But her mother, Ee Tha, 55, says she received only two payments in almost two years from her daughter’s Malaysian employer totalling $US270 ($A262). The employer deducted Orn Eak’s flight home from her salary, which was supposed to be $US180 a month. When Orn Eak arrived back in Phnom Penh in November a woman picked her up at the airport and took her to the employment agency. ”I told the story about the snake to a director … Five men came into the room and beat me … they pushed my head into a glass door and kicked me on the ground,” she says. Ee Tha received a message to come to Phnom Penh to take her daughter home. ”When I saw that my daughter’s face and body were cut and bruised my heart dropped,” Ee Tha says. After Ee Tha refused to leave the employment agency’s office with her daughter until she was given the money she was owed, a director finally handed over $1200 – meaning Orn Eak earned only $1470 for nearly two years’ work, half what had been promised. Social workers have verified her claims of abuse. Nine Cambodian domestic workers died in Malaysia in 2011, according to human rights organisations. Malaysian opposition MP Charles Santiago has accused the Malaysian government and police of ”totally disrespecting” laws by conducting only cursory investigations into the deaths. Human Rights Watch says common abuses include excessive work hours with no rest days, lack of food and irregular or non-payment of salaries. Many have reported sexual abuse, restrictions of movements and bans on contact with other maids. A Cambodian government ban on sending maids to Malaysia has been ignored by unscrupulous recruitment agencies. Kiddo and I had a couple of pork chops and eggplants last night, all cooked on the Webber Q. I also threw in a couple of sweet peppers. Tress didnt want any dinner as she had a biggish lunch at Little Nyonya again. Eggplants are rich sources of dietary fiber, vitamins and minerals and contain very less calories. This makes it an ideal component of the low fat diets and the diets of those working on weight loss. Other essential minerals contained in eggplant include potassium, manganese, magnesium and copper. 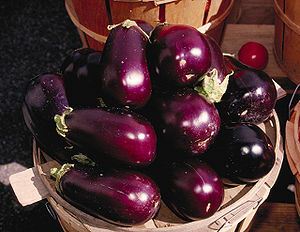 Eggplants are very important sources of phytonutrients, which is obtained from their deep purple color. Eggplants provide dietary fiber in abundance which is essential for regulating and facilitating smooth bowel movements. The dietary fiber in eggplant also helps, lower blood cholesterol and blood sugar levels. One cup serving of eggplant would contain approximately 10% of the recommended dietary fiber. Eggplants contain vitamins like vitamin C and b-vitamins, but they are not very high in content. One cup cooked serving of eggplant would contain approximately 2-5% of the recommended vitamin B1, vitamin B-3, vitamin B-6 and vitamin C.
A very interesting nutritional fact about eggplants are that they contain trace amounts of nicotine, which is absolutely harmless to the body. The nicotine levels in eggplants are way less than that in cigarettes. One cup serving of eggplant contains around 3% of the recommended potassium intake. The potassium in the eggplants is beneficial for those suffering from low blood pressure levels and it also regulates the beating of the heart. Calories and fats are something, that the eggplant contains the least and this is what makes it a healthy component of daily diet. This is the most important nutrients that eggplants contain. They contain phytonutrients like flavonoids, caffeic acid and chlorogenic acid. The flavonoid Nasunin in eggplants, has high levels of antioxidant properties and is known to be a scavenger of free radicals, thus protecting the cells of the body. Nasunin is also known for its ability to protect the fats surrounding the cell membrane of the brain. The chlorogenic acid it contains is known to be the most potent antioxidant that displays antimicrobial, antiviral and antitumor abilities and plays an important role in the prevention of many diseases. The table below has some detailed information on the eggplant nutritional facts.